We had a Fantastic Conference in September last with my fellow co-workers the "Rock Brothers". The theme of the Conference was "Prophetic Times - Now!". The Church in Portugal does not want to hear about the Prophetic and the Apostolic ministries in these last days! We do believe this and therefore are not accepted by the Portuguese Church in general. I believe that God is preparing the "Rock Brothers" and ourselves to form a powerful team to work together. He confirmed it once more in September 2006 through Pastor Ed Shirley (FMIN Partner) in September 2006. Speaking to the "Rock Brothers" and myself Pastor Ed Shirley told us that the Lord had knitted us 3 together in the spirit as in Ecclesiastes 4:12 : "...a threefold cord is not quickly broken". Well, we have experienced this in the Nations where we have worked and ministered together. We keep this vision in our hearts for it has strengthened our unity and vision. We even have some tremendous future projects we want to accomplish together. Back home we continue working toward fulfilling our vision of planting 10 churches in Portugal. I'm getting ready to plant the next Church in Lisbon, the capital city of Portugal. At the same time we are preparing people to pastor these future churches. Most people in this old Continent are turning more and more away from the things of God and into the hard lines of humanism so it is urgent that the Church of Jesus Christ spreads the Word and God's love to them. We shall press forward in these projects believing God at every single step of the way. I believe that God has a mighty move for Europe but this will only happen if His Church stops wandering around amusing themselves and starts pressing forward in Jesus mighty name. 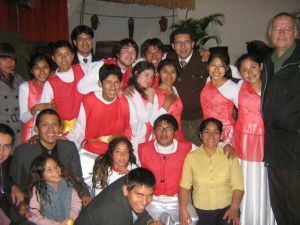 The picture above was taken in Peru during a Conference in August 2007. At the time we experienced a terrible Earthquake in that Country. Norton and Raquel have been planting and establishing churches in Portugal since 1988. They also are Directors of a Bible College in Coimbra Portugal. You guys are world changers! thanks for the update. more of His power manifest mightily.